4-HTMPIPO is a synthetic cannabinoid drug first identified in smoking products purchased from online vendors in 2012. 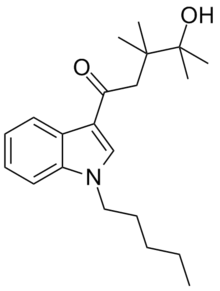 4-HTMPIPO is the product resulting from the electrophilic addition of water to the cyclopropane moiety of synthetic cannabinoid UR-144. Nothing is known about the in vitro or in vivo pharmacology of 4-HTMPIPO. ^ a b Kavanagh, P.; Grigoryev, A.; Savchuk, S.; Mikhura, I.; Formanovsky, A. (2013). "UR-144 in products soldviathe Internet: Identification of related compounds and characterization of pyrolysis products". Drug Testing and Analysis. 5 (8): 683–692. doi:10.1002/dta.1456. This page was last edited on 9 November 2018, at 07:27 (UTC).